Myopia is when objects that are near can be seen clearly, but objects that are at a distance are blurred. Myopia occurs when the eyeball is too long or the refractive power of the eye’s lens is too strong. The image is then focused in front of the retina rather than upon it. 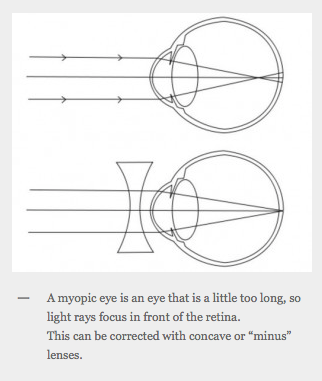 Glasses, contact lenses Lasik and lens replacement surgery are all options to consider for correction of myopia. Hyperopia is when objects that are near are blurred or just an effort to look at (eyestrain) Distance objects can be clear if hyperopia is mild but can also blur if hyperopia is more significan. 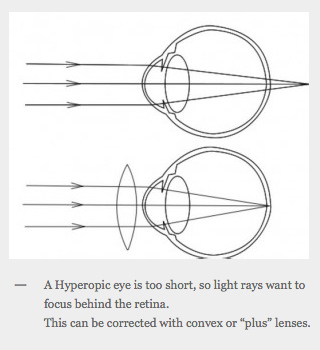 Hyperopia occurs when the image is focused behind the retina of the eye rather than on it. It is common for people to get headaches when trying to read. Glasses, contact lenses Lasik and lens replacement surgery are all options to consider. Astigmatism is a vision condition that occurs when the front surface of the eye, the cornea, is slightly irregular in shape. This irregular shape prevents light from focusing properly on the back of the eye, the retina. As a result, vision may be blurred at all distances. People with severe astigmatism will usually have blurred or distorted vision, while those with mild astigmatism may experience headaches, eyestrain, fatigue or blurred vision at certain distances. Most people have some degree of astigmatism. A comprehensive optometric examination will include testing to diagnose astigmatism and determine the degree. Almost all levels of astigmatism can be optically corrected with properly prescribed and fitted eyeglasses and/or contact lenses. 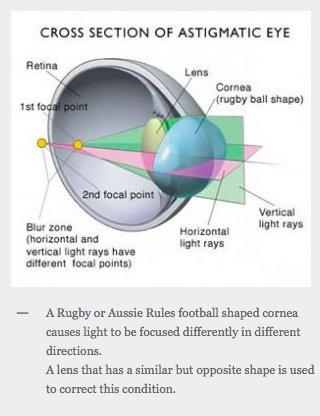 Astigmatism occurs when the cornea is shaped like an Aussie rules football, rather than a basketball, which is the normal shape. In most cases, the oval shape causes light rays to focus on two points in the back of your eye, rather than on just one. This is because an astigmatic cornea has both a steeper curve and a flatter one. Often astigmatism is hereditary: Many people are born with an oval cornea, resulting in vision problems that may get worse over time. But astigmatism may also result from an eye injury that has caused scarring on the cornea, from certain types of eye surgery, or from disease. Astigmatism can be corrected with glasses, contact lenses or laser surgery. Often confused with Hyperopia (longsightedness) presbyopia produces similar symptoms of reading difficulty. It usually starts in in the 40’s and rapidly worsens until early to mid 50s. Presbyopia is probably the most common condition requiring glasses. 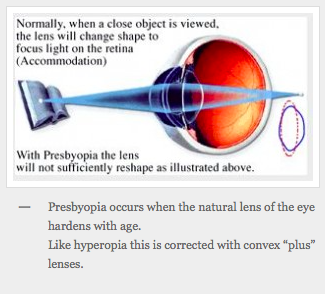 Presbyopia is caused by the natural aging of the internal lens of the eye. When you are younger the lens is soft and pliable, its shape and therefore its power can easily be changed by muscles that squeeze the lens into different shapes. As you are age the lens material hardens but it also becomes thicker and stiffer as it adds more and more onion like layers. The result is a lens that will no longer change shape and therefore will no longer focus at close distances. Reading glasses augment the power of the natural lens to restore close focus. Contact lenses can be used for presbyopia but involve significant compromises. The most common and successful technique is called monovision. Monovision involves setting one eye for distance and one for near. Multifocal contact lenses are also available but require you to look through both the reading and distance portions of the lens at the same time often causing a constant ghost image. We are happy to discuss any of the options with you. Laser or lens replacement surgery are not yet successful options for presbyopia treatment but are likely to be sometime into the future.